High quality results can be expected with every vape experience you have with Twelve Monkey Vapor Co. Buying Twelve Monkey Vapor Co is incredibly worth it, as these E-Liquids offer vapers premium taste and experience with a wide variety of flavours. What's more, they have evolved to match the expectations of even the most experienced vaper with complex blends and flavours to challenge the taste buds. Originating from Canada, these E-Liquids promise sweet flavours with every product. If you are wondering where to buy Twelve Monkey Vapor Co, you can easily find the latest blends and flavours at Redjuice, providing a wide range of choice for first-time vapers and those more experienced in the field. Buying Twelve Monkey Vapor Co online can also mean you can pick up popular bestsellers at the touch of a button. For a tantalising taste of the tropical, opt for Mangabeys, and lose yourself with their zesty blend of pineapple, guava and mango. Congo Cream offers a taste of nostalgia, with hints of vanilla, custard and strawberry, and a premium taste is guaranteed every time due to two distinct vanilla flavours blended perfectly to liven the strawberry taste. All Twelve Money Vapor Co E-Liquids can be enjoyed by 10ml bottles or 50ml short fill options. Gattago by Origins Twelve Monkeys Vapor Co Shortfill - Sweet white grapes with a Twelve Monkeys twist, a fruity vape you're going to love! Puris by Origins Twelve Monkeys Vapor Co Shortfill - Smooth and ripe peaches blended with a lemony citrus hit gives you a great tasting vape juice! Shoku by Origins Twelve Monkeys Vapor Co Shortfill - The perfect vape juice for any berry lover, fresh picked raspberries, sweet strawberry and a splash of passion fruit to round it all off. Sabae Iced by Twelve Monkeys eLiquid | Ice Age Series | 50ml Short Fill - There's only one way to eat a sorbet, and that's ice cold! Sabae Iced by Twelve Monkeys adds chilly menthol to its signature blend of lime, pineapple and raspberry flavours to complete the experience of eating a frosty sorbet. Nikko Iced by Twelve Monkeys eLiquid | Ice Age Series | 50ml Short Fill - What do you do to beat the heat during the summer? Do you drink a glass of lemonade, or do you eat a watermelon? What if you could experience both flavours at the same time? That's Nikko Iced by Twelve Monkeys in a nutshell -- and it's served with a fresh blast of menthol. Matata Iced by Twelve Monkeys eLiquid | Ice Age Series | 50ml Short Fill - Everyone's favourite orchard fruit blend served on ice, Matata Iced by Twelve Monkeys blends sweet grape juice and apple juice flavours with a hint of icy menthol for maximum refreshment. Hakuna Iced by Twelve Monkeys eLiquid | Ice Age Series | 50ml Short Fill - If you can't get enough apple in your life, we've got the answer for you. Hakuna Iced by Twelve Monkeys blends sweet Fuji apples with tart Granny Smith apples to create an e-liquid that expresses the full range of complexity in everyone's favourite fruit. With a bit of cranberry -- and some cool menthol -- thrown in for added deliciousness, this e-liquid is a complete experience for the entire palate. Kanzi Iced by Twelve Monkeys eLiquid | Ice Age Series | 50ml Short Fill - Do you eat hard candies by the handful because you can never pick just one flavour? Kanzi Iced by Twelve Monkeys is the e-liquid for you. In this juice, you'll taste a sweet hard candy flavour with notes of watermelon, kiwi and strawberry. Did we mention that this e-liquid is also served on ice? Saimiri by Origins - Twelve Monkeys Vapor Co eLiquid | 50ml Short Fill - Strawberries and cream? That's last year's e-liquid trend, and Saimiri by Twelve Monkeys is out to do something different. This e-liquid will delight you with its blend of sweet strawberries and rich coconut cream. Patas Pipe by Origins - Twelve Monkeys Vapor Co eLiquid | 50ml Short Fill - The mixologists at Twelve Monkeys have finally created a tobacco e-liquid! Pata's Pipe by Twelve Monkeys is a rich, aromatic pipe tobacco e-liquid with notes of chocolate and vanilla ice cream complementing the tobacco's natural sweetness. Papio by Origins - Twelve Monkeys Vapor Co eLiquid | 50ml Short Fill - Pineapple stores an enormous amount of water in its juicy flesh, making it uniquely refreshing and thirst quenching among fruits. Capture that experience in vapour form with Papio by Twelve Monkeys. Lemur by Origins - Twelve Monkeys Vapor Co eLiquid | 50ml Short Fill - When you combine lemon and lime, you get a blend that's greater than the sum of its parts -- but Lemur by Twelve Monkeys doesn't stop there. This e-liquid's cold blast of menthol delivers whole-body refreshment that just won't quit! Galago by Origins - Twelve Monkeys Vapor Co eLiquid | 50ml Short Fill - Spanning from the temperate orchards to the islands of Hawaii, Galago by Twelve Monkeys combines the notes of lychee and Concord grape to create a flavour blend unlike anything else. Tropika by Twelve Monkeys Vapor Co eLiquid | 50ml Short Fill - Can you guess all of the flavour notes in this tropical delight? Tropika is an island holiday in a bottle, but we're not telling you exactly what's in there. You'll have to pick out the flavours for yourself! O - RangZ by Twelve Monkeys Vapor Co eLiquid | 50ml Short Fill - O - RangZ by Twelve Monkeys is a perfect representation of your favourite fruity loops cereal in e-liquid form. Combining the flavours of citrus, toasted cereal grains and sweet milk, this cereal vape juice is certain to become a mainstay of your e-liquid rotation. Matata by Twelve Monkeys Vapor Co eLiquid | 50ml Short Fill - Matata by Twelve Monkeys is a trip to an orchard in e-liquid form. Blending the bold, fruity flavours of apple and grape, Matata has just enough tartness to keep your palate entertained all day. 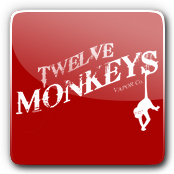 Mangabeys by Twelve Monkeys Vapor Co eLiquid | 50ml Short Fill - The perfect sweet and tart amalgamation of your favourite tropical flavours, Mangabeys by Twelve Monkeys is a nuanced blend of mango, pineapple and guava notes. It's like an instant trip to your favourite smoothie bar! MacaRaz by Twelve Monkeys Vapor Co eLiquid | 50ml Short Fill - MacaRaz by Twelve Monkeys captures the flavour of a freshly prepared macaron with plenty of delectable almond flavour. Complementing the rich almond base is a top note of freshly picked raspberry. Hakuna by Twelve Monkeys Vapor Co eLiquid | 50ml Short Fill - Hakuna by Twelve Monkeys is the perfect apple e-liquid with its blend of sweet Fuji and tart Granny Smith apple flavours. What's that extra bit of complexity that you detect on the exhale? It's a dash of cranberry flavour. Harambae by Twelve Monkeys Vapor Co eLiquid | 50ml Short Fill - A tropical citrus e-liquid with a twist, Harambae by Twelve Monkeys begins with an exotic blend of blood orange, lemon, lime and grapefruit flavours -- but it doesn't stop there. In this juice, you'll also detect a hint of sweet guava flavour that cuts through the tart flavour profile. Kanzi by Twelve Monkeys Vapor Co eLiquid | 50ml Short Fill - Kanzi by Twelve Monkeys is full of the sweetest summer fruits blended to perfection. With its combination of watermelon, kiwi and strawberry flavours, this juice is a must for any fruit lover with a sweet tooth. Congo Cream by Twelve Monkeys Vapor Co eLiquid | 50ml Short Fill - If you ask us, the only thing that can make custard better is a little tart fruit to cut the richness. Congo Cream by Twelve Monkeys does exactly that with a ripe, juicy strawberry flavour blended with a sumptuous custard base. This nuanced blend features two different vanilla flavours. Bonogurt by Twelve Monkeys Vapor Co eLiquid | 50ml Short Fill - If you're searching for a change of pace from your usual sweet e-liquids, Bonogurt by Twelve Monkeys is just the ticket. This e-liquid layers the notes of ripe summer berries over a tangy yoghurt base that's sure to make your lips pucker. Bonogurt by Twelve Monkeys eLiquid | 10ml Bottles - It's time for a yoghurt e-liquid that delivers a more complete vaping experience. Bonogurt by Twelve Monkeys combines smooth, tangy yoghurt with the ripest berries of summer. Who could ask for more? Congo Cream by Twelve Monkeys eLiquid | 10ml Bottles - Just another strawberries-and-cream e-liquid? No way. Congo Cream by Twelve Monkeys fuses ripe strawberries to a smooth, complex custard base lovingly blended with two different vanilla flavours. Kanzi by Twelve Monkeys eLiquid | 10ml Bottles - You've tried the rest of the candy e-liquids; now it's time to try the best. Kanzi by Twelve Monkeys is a hard candy e-liquid with flavours of kiwi, strawberry and melon that linger on the palate long after you've exhaled the vapour. MacaRaz by Twelve Monkeys eLiquid | 10ml Bottles - We could never resist an authentic French macaron. Are you with us? You'll love how MacaRaz by Twelve Monkeys combines a fluffy egg white macaron base with notes of almond and raspberry. Mangabeys by Twelve Monkeys eLiquid | 10ml Bottles - Here's a trio of tropical fruits that's guaranteed to leave your palate tingling. Mangabeys by Twelve Monkeys is a lovely blend of sweet mango, guava and pineapple flavours. Matata by Twelve Monkeys eLiquid | 10ml Bottles - What do you call a fruit that's a cross between grape and apple? A grapple, maybe? We're not sure, but we do know that Matata by Twelve Monkeys features a pretty tasty blend of apple and grape flavours. O-RangZ by Twelve Monkeys eLiquid | 10ml Bottles - If you've been craving a cereal e-liquid that brings something truly original to the table, O-RangZ by Twelve Monkeys is your dream come true. It's a toasty, tangy lemon cereal with plenty of milk poured on top. Tropika by Twelve Monkeys eLiquid | 10ml Bottles - Can you keep a secret? The monkeys can, and they're not telling what's in this e-liquid. Tropika by Twelve Monkeys is a secret blend of tropical fruits, and that's all we know!